According to Energy Star, lighting accounts for up to 20% of the average home’s electric bill. Yowza! They say if I switch out at least 25 % of my incandescent light bulbs to Compact Fluorescent Light bulbs (CFLs) it is an easy peasy way for me to be on my merry way of reducing my energy usage this by 20% this year. Just by the simple act of changing a light bulb? Lazy environmentalism. Sweet. Just the way I like it. For giggles, I counted the number of light bulbs in the house so I could calculate my current household percentage of eco-bulbs before The Great Light Bulb Switch. It took me awhile to get an accurate number because my initial count forgot the light bulbs in fixtures I don’t use very often or think about like in various closets, the back porch, and the utility room. I have 58 light bulbs. Seems like a lot, but some of my light fixtures use more than one light bulb. Twenty five of these light bulbs are some form of energy efficient light bulb: a combination of fluorescent, compact florescent (CFL), halogen, and Verilux Full Spectrum Light Bulbs. Expense yes, but the Verilux Full Spectrum Light Bulbs are supposed to use less energy and show colors more accurately than a standard incandescent light bulb, which is important when I’m designing something. They are also supposed to make me happy during those gray Ohio days and save me from putting a bid on the colossally expensive Happy House. Now that I have the numbers, what’s my percentage of energy saving light bulbs? Let’s do some math and calculate this puppy. Well, actually, we’re about to calculate a percentage of numbers. If you want to calculate a puppy, I suggest you go to your local animal shelter or rescue group and adopt. 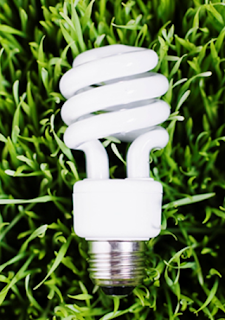 25 eco-bulbs divided by 58 total household light bulbs = 43% of our light bulbs are energy efficient. ...and yet why isn’t my 43% of energy efficient lighting goodness reflected on my not-yet-lower electric bill? Time to switch out more light bulbs even before the suckers burn out. I'll make the financial hit a little less by buying one three pack of CFLs every time I go grocery shopping. It may take me a little longer to do the switchover, but at least it I wont' have to put up an extra $200 all at once to do it.